2000 was the year of Search Engine Optimization, 2010 was the year of Social Media and it seems like 2018 is going to be the year of chatbots. In one of our previous blogs, we talked about how chatbots have failed miserably in their endeavor of sparking meaningful conversations with users. But the tables have completely turned now! The recent developments in the field of AI and chatbots have made huge leaps from the start of this year and haven’t looked back ever since. Developers have now found a sweet spot to make chatbots work like they are supposed to and brands are jumping on this bandwagon again in heaps. And modern chatbots are surprisingly easy to set-up and install. You can easily set-up one on your website, messaging platforms or social media accounts as there are now quick integrations available to use your chatbot on the platform you like. But the best part is that most of them don’t require any coding knowledge at all. 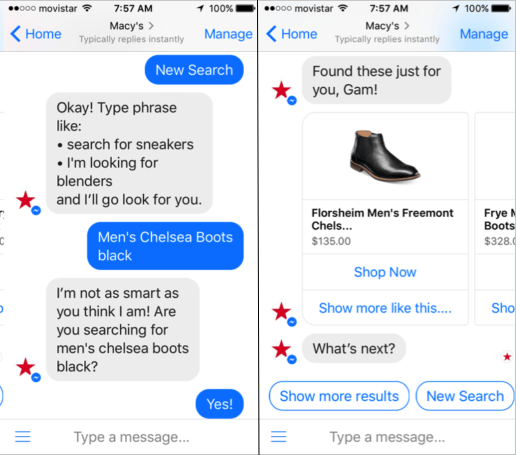 From a marketing perspective, chatbots have always been great at driving engagement. Combined with the recent advances in AI, NLU (natural language understanding) and machine learning, they really have become a force to be reckoned with. So if you are looking to hire a chatbot for marketing your own brand, there is no better time than now! Starting with the obvious, It’s a no-brainer that a chatbot can easily be your next best customer support executive that’s up and working 24*7. Providing quick replies has always been a hurdle for brands trying to provide excellent customer support and with chatbots, it becomes fairly easy. Whether your customers are seeking for help on your website or one of your social media accounts (most probably Facebook), employing a chatbot on your preferred platform will help reduce friction and boost your overall customer experience marginally. 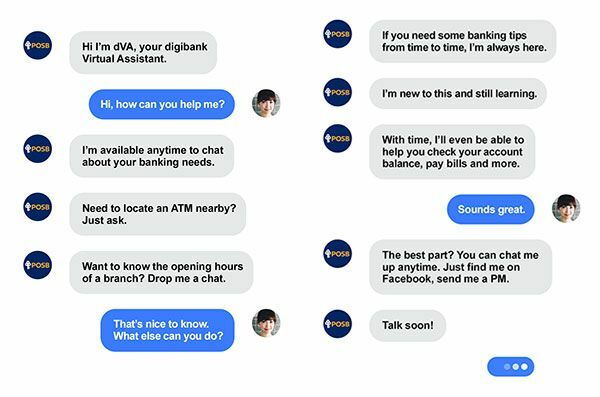 While this is the most basic use-case of a Chatbot and the sole reason for which they were used for initially, modern Chatbots can do a lot more. When users visit your website, most probably they’d want to look at your products, they even can have some burning questions about the products and services you provide and would love some quick answers. 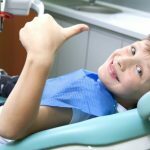 According to a study, If you are not able to answer quickly, they may never return to your website again. In situations like these, a chatbot can really be your knight in shining armor. 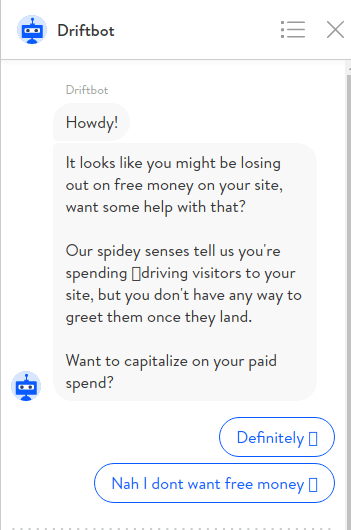 There are chatbots dedicated to providing this functionality on a website through live-chat. Give it a nice profile pic, a conversational tone, and a swanky name, and your users won’t even know if they are talking to a bot or a real person. Or you can keep it simple and straightforward like Levi’s. 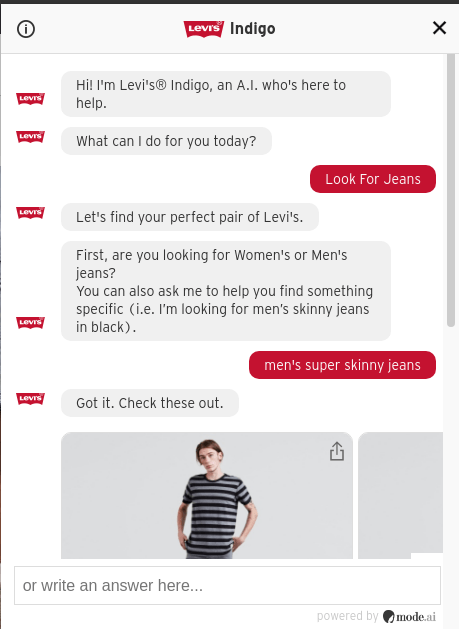 Levi’s Indigo helps its website visitors find their suitable products (which we’ll talk about in a while), get help and read blog articles, all accessible through the chatbot. Users really don’t care about it as long as their problems are being taken care of. Also, 48% of users prefer choosing live-chat as a medium to interact with a brand rather than emails, according to a study. I like how Drift has explained it nicely on their homepage how their chatbot (or leadbot) can really transform your sales funnel for good. 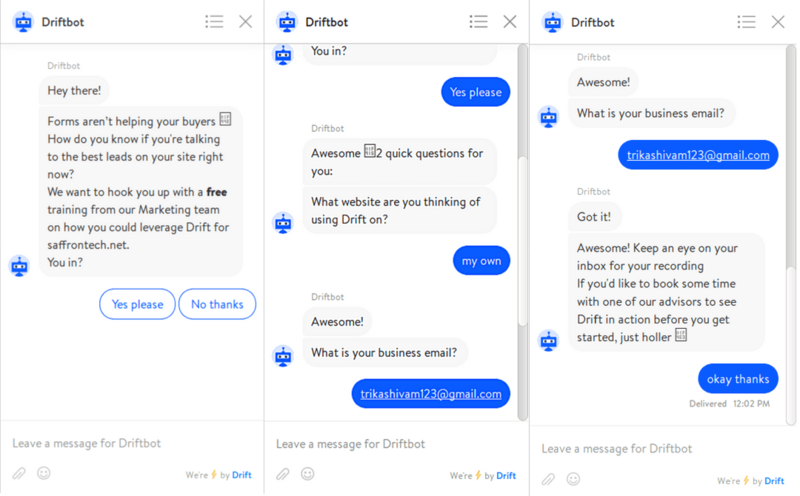 Also, did I mention Drift is the only company that managed to bring the limelight back on chatbots with their newly named concept? So, being experts in ‘Conversational Marketing’, you’d think they’d know a thing or two about how to convert leads, right? I thought the same and tried out their Driftbot for a while and every time I visited their website, the Driftbot always had something new to say to me to make me convert…. Which you can do on your site as well, your creativity is your limit when it comes to converting leads through conversational marketing. But one thing is for sure, chatbots indeed cut a lot of time out of your customer journey, which is always a good thing, for both your business and your customers. 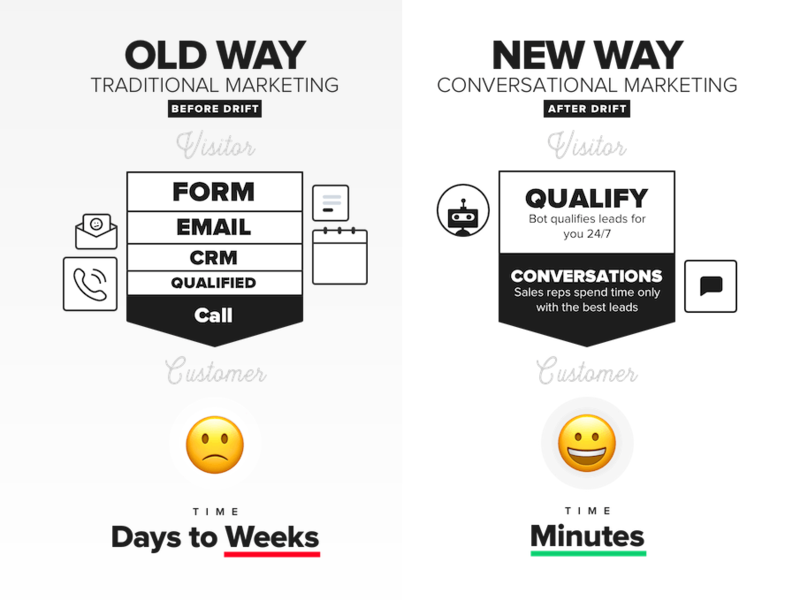 Conversational Marketing lets your sales team focus on the best leads filtered by your chatbots in, as drift mentioned, minutes. Some people have said that lead qualifying chatbots have shortened their lead qualifying process by 18 days! And when integrated with Salesforce and other tools intended for your sales team, it can really streamline your sales processes. If you are a B2C brand, selling your products in a casual manner becomes easy with a chatbot as everything is done with conversations and not hard selling. And customers will be prompted to buy as well, as they’ll be shown personalized items based on their own choices. 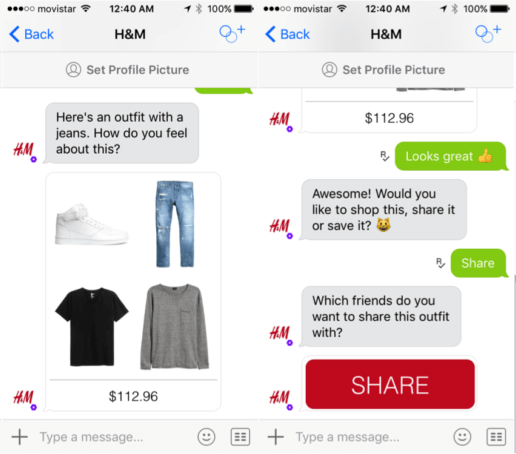 H&M has their own bot to sell their products on the platform Kik. If you had typed ‘Shop this’ instead, then the chatbot would redirect you directly to their site to make the final purchase. See how simple the process becomes for users! Usually, chatbots come with analytics, if not, there are bots that can provide this functionality to a bot. Anyways, the thing to focus here is that bot analytics can come in handy if you ever choose to employ a bot for your brand. With the help of analytics, you can easily monitor all the chats your bot has had with users, see the most searched for products, track conversions, return visits & more. But most importantly, analytics can be used to see if the conversational tone that you’ve set for your bot is going well with your user base or not. 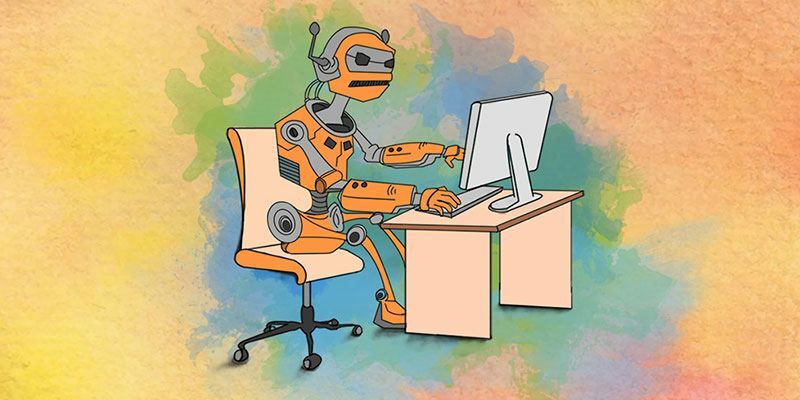 And if your bot is not making many conversions, you can easily change the tone of your bot to get the best out of your bot’s marketing efforts. Modern chatbots have come a long way from just being your customer support executives. Today, they can proudly be your brand’s voice, the first point of contact and sales executives. 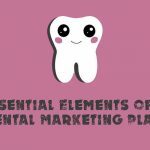 While I have tried to list some cases where you can use a chatbot to enhance your brand’s user experience, you can use them in a lot more creative ways, totally depends on what you want to do with your chatbot.